Now that the new year has begun, it’s an opportunity to set the reset button on our habits and routines. One of the obvious choices for meals when eating healthy is salad. I have to admit, I have not always been a salad fan. Salads can be bland and boring and quickly lose their appeal. Its hard to get excited to eat SALAD!! Soooo, I’ve been on the hunt for new and delicious salad recipes that I can get excited about! This recipe is my current favourite! It’s pretty simple to make and is a real crowd pleaser! I hope you like it! 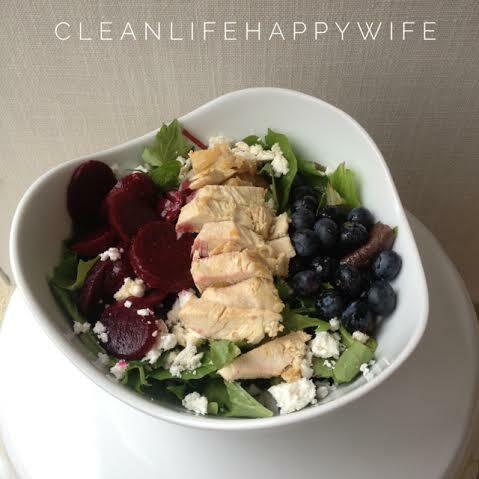 Combine the lettuce, blueberries, beets, and feta in a bowl. In a small separate bowl mix the oil and vinaigrette and poor onto the salad. Heat a pan on the stovetop and cook the garlic and coconut oil until lightly browned. Cook the chicken breast in the pan with the garlic. Once the chicken is fully cooked, add it to the salad and sprinkle with sea salt. If you are feeling really fancy you can get creative an add in other things as well! A few of the things I have experimented with are almonds, avocado, boiled egg, or raspberries!